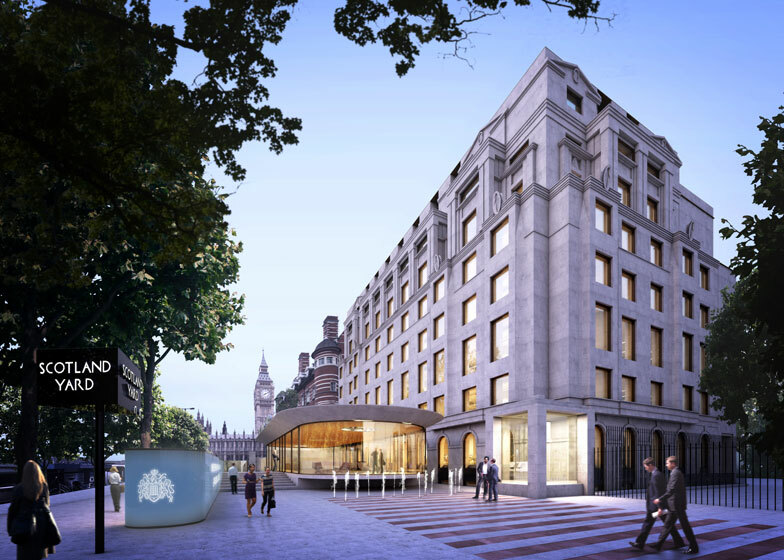 News: London firm Allford Hall Monaghan Morris has won a competition to design the new Scotland Yard headquarters for the London Metropolitan Police. Allford Hall Monaghan Morris (AHMM), who are currently also working on Google's new London headquarters, will renovate the riverside Curtis Green building in Whitehall - a former police station - to replace the existing New Scotland Yard building in Westminster. The architects propose "a police headquarters that will be more open and accessible, and will help the Met reconnect with the public." It will feature a new public entrance pavilion, extensions to the existing building and a series of public spaces, designed in collaboration with specialist architects Haverstock. The well-known revolving sign will be retained and relocated, as will the Eternal Flame and Roll of Honour. Paul Monaghan, a director at AHMM, said: "This is a very important project for AHMM with the opportunity to work with one of the most significant and longest established law enforcement bodies in the world. We look forward to working with the Metropolitan Police Service to develop a building that supports them in their changing role within the city." The police will move into the new building in 2015, while the old building will be sold to raise funds that will be reinvested in frontline policing. AHMM saw off four other shortlisted practices including Foster + Partners and Allies and Morrison to win the competition, which was organised by the Royal Institute of British Architects (RIBA). "Through the careful extension of the public realm across the site and consideration of its neighbours in massing and materiality terms, these proposals will serve to strengthen this cohesion," said RIBA competitions adviser Bill Taylor. "Weaving the heritage and culture of the Metropolitan Police into the fabric of the building and the spaces that surround it, the proposals strike a balance between respect for what already exists and the desire of the client to present a new, open and progressive face to the community they serve," he added. AHMM presented proposals for a Google campus in London's King's Cross earlier this year and also recently completed a London hospice designed to look like an oversized house.